The Daily GRRR! HEADLINES for March 19th, 2015. 1. 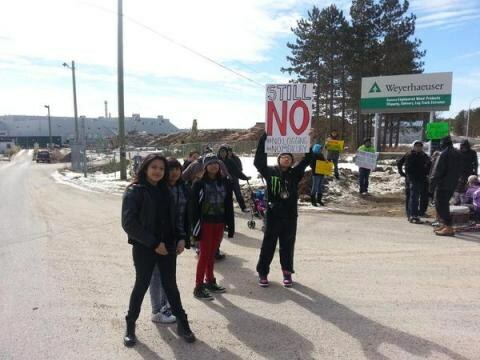 Grassy Narrows Maintains Autonomy, Says "No" to Logging in the Whiskey Jack Forest. 2. Lubicon Lake Nation Back In Court to Defend Land. 3. Onondaga Nation Decries "Native" Mascots for Settler Establishments. 4. Arrested ISIS Agent Claims CSIS Employment. 5. Cambridge Musicians Respond to Police Targeting of Busker. Welcome, I am your host dan kellar and you are listening to The Daily GRRR! on 100.3fm, CKMS in Waterloo, Ontario. Soundfm.ca on the web, today is Thursday March 19th, 2015. We are broadcasting from the centre of the Haldimand Tract, the occupied Grand River Territory of the Haudenosaunee. Today’s feature is an interview with Amar Wala, the director of the award-winning documentary The Secret Trial 5, which takes a critical look at Canada's security certificate regime. The documentary will be showing tonight at 6:30pm at the Princess Cinemas in Waterloo, followed by a Q and A with the #ST5Film team. Members of the Grassy Narrows youth group alongside community elders, band councillors, drum-circle members and others, restated their opposition to logging in their territory in a series of actions on March 16, including demos at the Weyerhaeuser mill and the Regional Ministry of Natural Resources and Forestry offices in Kenora. The stated demands are clear: Since "The Grassroots People of Grassy Narrows have always opposed logging because of the damage it does to the land and in turn, to their ability to live culturally as Anishinabe People… Grassroots People from Grassy Narrows are demanding that MNRF remove all cut blocks within Grassy Narrows Traditional territory from the long term FMP for the Whiskey Jack Forest." While logging has been again apparently suspended for the upcoming operating season, the long term plan from the government still targets the territory of the Grassy Narrows people. Randy Forbister, an organiser of the event and a band councillor said "Our land is our culture, and traditions as a people… When the land is compromised in any way, our culture and traditions will be compromised.” Saying he looks to the youth Forbister added, "They are the future who will continue to strengthen the culture and traditions." The press release adds: "Later this month, individuals and groups from Grassy Narrows will be participating in the Water March in Kenora, organized by Grassroots Indigenous Water Defence to mark World Water Day on March 22." The 12 year long logging blockade in Grassy Narrows territory gains strength with each season, and premier Kathleen Wynne needs to respect the autonomy and treaty rights of the Anishinaabe people by revoking any current logging permits and removing the Whisky Jack forest and other treaty and traditional territory from future logging plans. Later today, the Lubicon Lake Nation will again be in Alberta court defending their Indigenous rights and title to their land from oil and gas development - including fracking. This time the target is PennWest Petroleum who, since November 2013, has been in the crosshairs of the the Lubicon as the company has been exploring and developing fossil-fuel extraction, in the Indigenous nation's territory. While PennWest argues that since Alberta has given them permits to operate, the Lubicon have no legitimate quarrel. However, the "lawyer for the Lubicon Lake Nation, James O’Reilly contends that the issue is a matter of existing aboriginal title and rights held by the Lubicon Lake Nation, which should take precedence over harmful exploitation activity by an oil and gas company and calls into question whether Alberta has the authority to issue such permits in the first place. BreifingWire.com notes "This action will be heard in the shadow of a spill of toxic oil and gas condensate by nearby Murphy Oil Company into wetlands used by the Lubicon Lake Nation, which has been estimated to be at least 2.7 million Litres in size only a few weeks ago." Saying "The Nation regards the depiction of natives as mascots defamatory to our people" the Onondaga Nation Council Chiefs have released a statement arguing that mascots "tend to suspend natives in time", further enable a culture of superiority, and are "stereotypical"
The statement reads: Fighting and skin color is not our only positive trait. Although it is true that Onondaga and its Haudenosaunee allies have proven themselves in battle, there are other gifts that we are thankful for. Onondagas honor and foster many other traits such as diplomacy, artisans, educators, agriculturists, hunters, musicians, architects, and philosophers to name a few. The Creator gives us all a special gift and it is the combination of all these gifts that make us the complex diverse nation of people we are today." The letter from the Onondaga Nation Council of Chiefs notes that in 1971, Syracuse University changed their offensive mascot after a year of consultation with the group. The most widespread campaign currently ongoing against an offensive mascot is that based against the NFL team in Washington D.C. In Waterloo region most teams have switched away from using racist and inaccurate representations of Indigenous peoples as their mascots, with others stubbornly clinging onto their assumed colonial supremacy. Mohammed al-Rashed, who was arrested by militant Turkish authorities last month for allegedly assisting more than a dozen people across the Turkish border to join Islamic State militants, apparently told his interrogators that he was working for the Canadian Security Intelligence Service. While the canadian government denies any connection with Mr. al-Rashed, it is alleged that the man was brought into the service of CSIS after he contacted canadian officials in 2013 about seeking asylum in Canada. Mr. al-Rashed told his captors that he was offered citizenship in return for any information he could provide on ISIS operations. Among those al-Rashed is alleged to have helped join ISIS are the 3 british teenage women who left their families earlier this year. As more information is uncovered about this situation we will report on it. Last week, local musician Liv Gains was ticketed by a Waterloo region police officer for allegedly "soliciting" while she was busking in front of a store, with permission of the owners. The artist was ticketed despite the fact that it is not against any by-law to busk in Cambridge, and the officer alleged that the person Gains illegally "solicited" was more than 100m away. In response to the crackdown on minstreling in the downtown, more than a dozen musicians showed up for a "busk-in" with several dozen supporters and onlookers, a couple of city councillors, and a throng of media. Police kept their distance this time around, managing to avoid illegitimately targeting anyone for the duration of the event. Thats all for headlines, lets take a little break and go to a song, here is a tune from The Rebel Spell, this is Rebels Sing. And we are back, you just heard The Rebel Spell with Rebels Sing. Tragically, Todd Serious of The Rebel Spell, died earlier this month at the age of 41 following a rock climbing fall. See last Thursday's show for our tribute to Todd. You are listening to the The Daily GRRR! Today is Thursday March 19th, 2015 and my name is dan kellar and we are now moving into the feature portion of our broadcast. Feature: an interview w/ Amar Wala, the director of the award-winning documentary The Secret Trial 5, which takes a critical look at Canada's security certificate regime. We also discuss parallels with Harper's proposed anti-terror legislation Bill C-51 and the stigma of terror suspicion, among other things. That was an interview w/ Amar Wala, the director of the award-winning documentary The Secret Trial 5, which takes a critical look at Canada's security certificate regime. The documentary will be showing tonight at 6:30pm at the Princess Cinemas in Waterloo, followed by a Q and A with the #ST5Film team.